I’m speaking about the team of Famous Monsters of Filmland and Captured Aural Phantasy Theater. 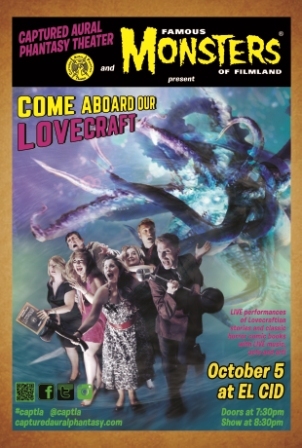 They invite everyone to attend Come Aboard Our Lovecraft at LA’s historic El Cid on Sunday, October 5. [We] will be showcasing live performances of H.P. Lovecraft stories performed in our signature variety show/ old radio show style. The evening also includes mid-century Lovecraft-inspired horror comic books brought to life on stage with original art, live sound effects and a live soundtrack. These aren’t heart-warming tales! Along with the multi-media Lovecraft story and comic book performances, the evening includes comedic acts, prizes and the finest live music. Tickets are $10. The El Cid is located at 4212 W. Sunset Blvd. Doors open at 7:30 p.m. and dinner seating begins. The show starts at 8:30 p.m. This entry was posted in Like Show Business and tagged Lovecraft by Mike Glyer. Bookmark the permalink.